A book all about priming your body for fertility, with plenty of tips and tricks for a wellness overhaul and the "how to steps" to set yourself up to win. 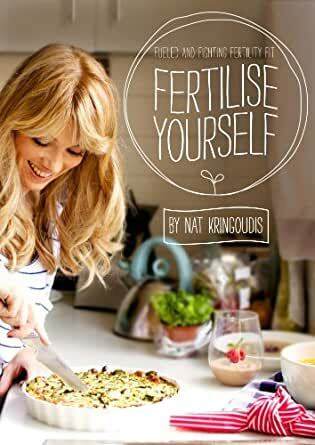 If you're struggling with your fertility or even just your general health, this book can help you navigate your way to being fighting fertile fit. 3.0 out of 5 starsWhere is the meat? A vegetarian and low fat diet is what left me with fertility issues. Nat, I love what you do, but where is the meat? She knows that it is super important for fertility but seems to scared to offend the vegetarian community...What can I say, I am really disappointed. I bought this book looking for help on how to eat more healthy and traditional foods, but wound up with another 'health' book on watery, low fat yin foods. Not what the infertile population needs at all. I was a vegetarian for over 20 years and I wound up with hormone problems from not having enough fat and quality protein in my diet. Women need to change their thinking around this and its a shame Nat didn't have the guts to help more. Aside from the recipes all the other information is really good. I have decided I will have to buy the Sally Fallon book instead (but it is no where near as pretty as Nat's). I was really disappointed in this book, some great recipes but very light on information. 1.0 out of 5 starsIs that it? Very disappointed with this book - only 60 pages and half of that is recipes. I thought it would be a lot more detailed, but instead it seemed to barely scratch the surface. Waste of $10. Nothing new or interesting that is not on every single free fertility website. I enjoyed this book as it was to the point but very informing. I'll surely be referencing it in the future!